I found these Toyboys last Friday at Garden Show Ireland in the grounds of Antrim Castle, on a bright sun filled day. When I came home my cheeks were glowing. Glowing from the sunshine… what else were you thinking? At my age even thinking about ‘it’ would wear me out! I did have some fun with this guy I found in the Flower arranging tent. This entry was posted in Fun and tagged Fun, Garden Show Ireland on May 12, 2016 by Grannymar. The tall Toyboys or Mr Moss? Actually, since my page only showed a small screen at first, the first thing I saw was you in the middle as the center, with two headless giants. It’s a great picture that way. but actually both are pretty interesting. Ps doing family genealogy, and just found out my ggg… grandfather, Adam White, was hanged for being a presbyterian preacher in Antrim. His two sons went to America. Trust me to find headless men!! Family genealogy, an interesting pastime. You never know what dark colourful secrets from the past you will discover! My family tree covers about six generations but two of those are below me. The oldest person I discovered was born in 1763 and I have a picture of him! There is a continuous line from him at the old homestead to this day. Three toyboys and plenty of sunshine! What an outing you have had. Safety in numbers, Ramana. Those guys were as tall as a skyscraper! Cathy, it was a very interesting day, display gardens, school projects, plant stalls, demonstrations, blacksmith and food plus the usual trade stalls. Something for everybody. Never too Granny to glow! Fabulous pictures, I’m still grinning! Spiders, my aim is to bring a smile and laughter to everyone who visits. Far too much gloom in this world. Are they made up or totally plastered in sunscreen? You may be of more compact construction, but you look a whole lot healthier! Their faces were white, I took it to be make-up. 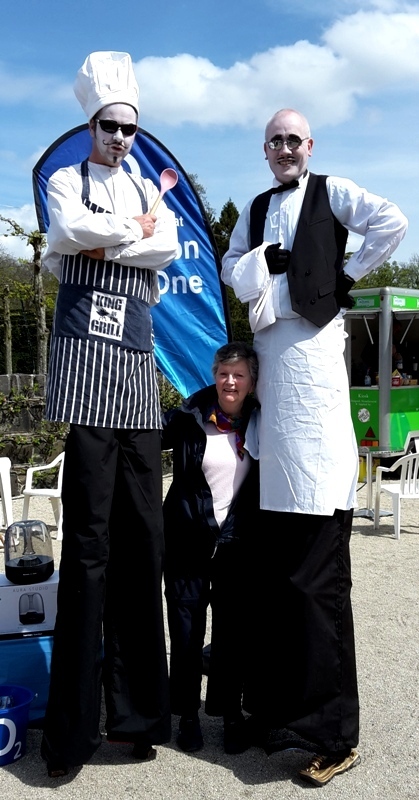 Stilt walkers are becoming a regular sight at outdoor events. I do look so small in there and I am 5′ 7″, they look twice that size! It was a good day and the sun shone!